– from ‘Vancouver Teranet HPI Trendline Analysis’, by jesse, at Housing Analysis, 30 Mar 2012, see his article for definitions of various trend lines. jesse’s analysis assumes return to various arguably-valid trend lines. In each case there is the possibility of overshoot, a common scenario when ‘reverting to the mean’. This analysis can be compared with our own technical analysis, previously posted [VREAA 11 Sep 2010, updates 12 Oct 2011 and 2 Jan 2012; see below]. Note, of course, that our analysis is of Vancouver average SFH prices, not the Teranet data which jesse’s analysis uses, and is limited by the use of straight lines on linear scale charts. We foresee an ultimate reversion to a trendline reflecting growth at the rate of inflation (roughly equivalent to jesse’s ‘Old Normal’) but, given the magnitude of the diversion from mean on the way up, we fully expect a large overshoot to the downside on the way down. The speculative component will likely be completely wrung out of the market, and this will probably require a return to early 2000’s prices. 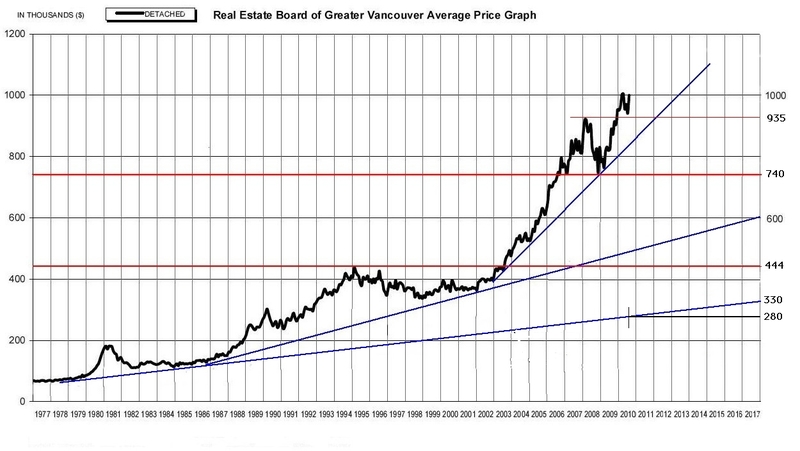 That equates to the 75 range on the Teranet chart, and the 444K+ range on the Vancouver SFH chart. Thus, 50%-66%-off the peak prices. In view of discussion on the previous thread, we add this chart for illustration and ongoing chat. [This is a nominal average price chart, and the axes are linear. – Very steep channel support from 2009-2012 now violated to downside. – Mild horizontal support comes in at $1M (‘big number support’ and 2010 congestion). – Steep channel support from 2003-present still intact; bottom rail (support) now comes in at $935K-$970K for 2012. With added horizontal support at $935K, the $935K-$970K area is important through the coming year. – The most important support level is arguably the lows of 2008-2009. We anticipate that, once the 2003-present channel gives, there will be a relatively quick move to $740K, a likely bounce there (to fool the folks who think that that is a superb entry point, given memories of 2009), before it is violated to the downside. Ultimate support in $444K-$600K range, the likely bottom targets (thus 50%-66% off from peak). May overshoot to downside, as often happens when such a massive generational speculative mania implodes. 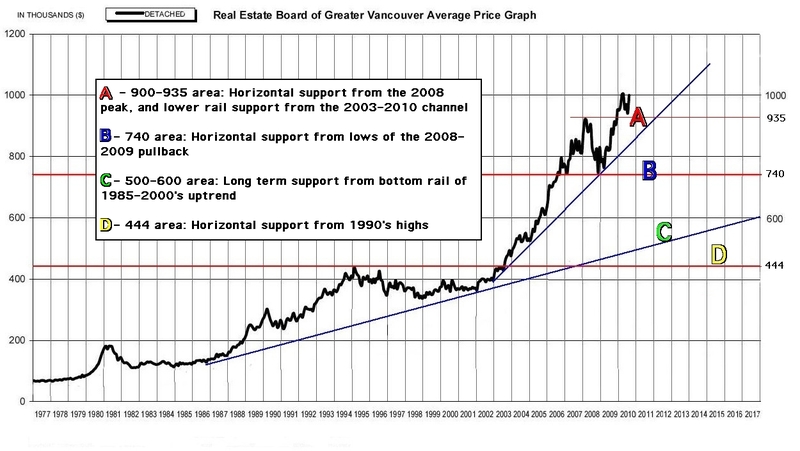 If Shiller is right, and Vancouver SFHs ends up only increasing at the rate of inflation from the 1978-1986 region, ultimate support could be in the unimaginable $300K-$330K range. It’d probably take an economic depression to see those numbers. Only a lunatic makes real estate sell or buy decisions based solely on charts, but, conversely, only a fool would say that past price action is irrelevant. Technical analysis (‘TA’) involves the study of chart patterns for clues to future price movement. It looks at the places where buyers and sellers have met in the past, and uses charts to attempt to predict where they may do so in future. To look at TA of the Vancouver RE market, we have used the REBGV chart of the average nominal price of a detached single-family house for the Greater Vancouver area. 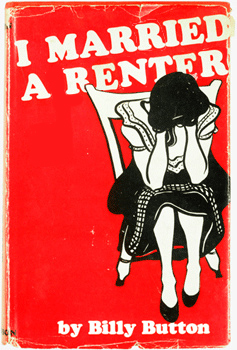 It would be methodologically better to have a look at a similar price chart of a benchmark house, or better still, a Case-Shiller type of same-house-resale price chart, and even better real (not nominal) Case-Shiller, but, as we don’t have such charts going back to the 1970’s, we’ll use average detached price here. We’d expect the general price action to look very similar for all of these charts over the next 10 years, but obviously the specific numbers will be different. So, keep in mind that you’re looking at average nominal detached price charts here. The chart is updated by the REBGV each month. As of the August 2010 numbers, that price was $999,400, essentially $1M. This analysis is not going to need to make use of more exotic TA interpretations. We’re not looking at ‘cups and handles’, ‘saucers’, and will barely mention the common ‘head and shoulders’ pattern (for those interested, it’s visible in the scenario (2) chart below). What is far more important is evidence for levels of price support under the market. Even bulls are anticipating a pause or slowing, and the question isn’t so much “Will the Vancouver RE market pullback?” but rather “How big will the pullback be?”. The recent and much publicized report from the Canadian Centre for Policy Alternatives, ‘Canada’s Housing Bubble: An Accident Waiting to Happen’, by David Macdonald, Aug 2010. 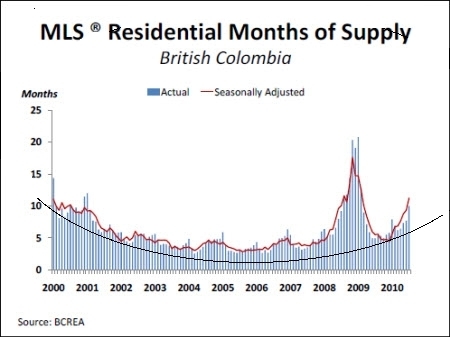 (pdf here) predicted possible price drops of between 20%-31% peak to trough for the Vancouver market (using average residential housing prices adjusted for inflation). This report garnered much mainstream criticism, with claims that such pullbacks were inconceivably large. As you’ll see from the REBGV charts, the run-up since 2001 has itself been so large that the CCPA estimates are probably on the low side. The first and arguably most important price level is that illustrated by ‘B’, the 740 area, 26% below the current price, as defined by horizontal support from lows of the 2008-2009 pullback. The psychological importance of this level is crucial. Thus far, those buyers who stepped in to buy the 2008-2009 pullback look smart, and they are pleased with their paper gains. It is thus likely that there is at least a small group of prospective buyers who would look at any fall to those levels as a buying opportunity. In a related sense, if and when the 740 area is penetrated to the downside, many prospective buyers will back off (asking themselves “how down far can this go?”) and at least some sellers will come into the market, fearing future losses. 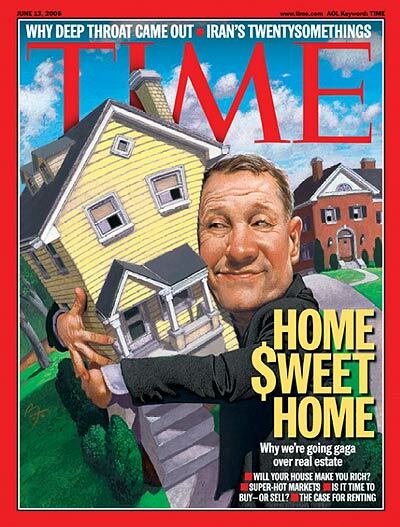 Remember, it only takes a small percent of owners to try and sell with some urgency for prices to fall precipitously. Thus, if 740 is broached to the downside, we’d expect prices to fall to the 500-600 area of support in relatively short order. We personally anticipate that the 740 area will indeed fail as support, perhaps after a bounce at that level first. The second most important price support level is illustrated by ‘C’, the 500-600 area, 40-50% below the current price, as defined by long term support from the bottom rail of 1985-2000’s uptrend. This is where prices would be “if we hadn’t had a bubble”. At this moment that support is below 500, and thus suggests that RE prices in Vancouver are >2 times overvalued. This meshes very well with overvaluation estimates based on fundamental analysis using price:rent and price:income ratios, and we thus find this level of support a very persuasive target. We have a very high index of suspicion that prices will hit ‘C’ support at some point in coming years, likely by 2013. 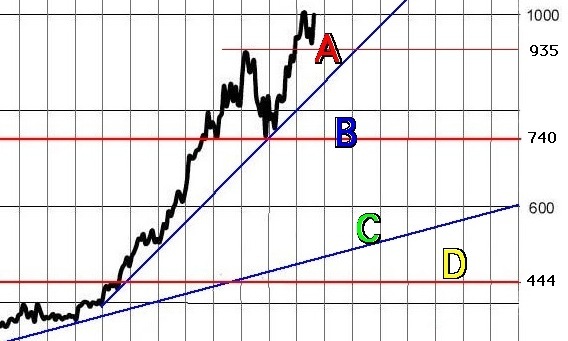 The ‘D’ support line, coming in somewhat perversely at 444, may seem preposterously pessimistic to most market participants as it implies 55% price drops. However, when markets overextend to the upside they often react with overextension on the downside, and levels in the 400 area may be reached if past irrational optimism is replaced with similar degrees of irrational pessimism. These are realistic targets if RE becomes a truly detested asset class in Vancouver. Our weightings are not based on TA alone, obviously. We don’t see a drop to the lows of 2008-2009 as being enough to rid the market of the speculative excesses of the last decade, and we don’t see how enough buyers will step in to rescue the market at those levels, given debt levels, ownership rates, fundamental overvaluation, RE over-dependence, degree of speculator involvement, leverage, boomer supply, and economic outlook. Perhaps readers will care to post their own probability estimates for each of the different chart scenarios in the comments section below. This longer-term support line is in the 280-330 area. From 1998 to 2010 it increased at a rate equivalent to 2.84% pa compounded. Mean inflation rate was 2.6% 1986 to present. This essentially agrees with Shiller’s long term analysis showing that RE returns 0% after inflation. Suggesting price drops back to this support line implies a pullback of about 70%, the thought of which would make even the most ardent bear blush. As dreadful as it sounds, it could be a real possibility: deflationary waves, plus boomers liquidating, plus dearth of buyers could do it.